After six weeks on the road, I'm finally back home - and thus we have my BIGGEST EVER update. Be sure to scroll all the way down to see all the good news & many new paintings! Firstly - I'm getting ready for my next Disney show - next Saturday, August 19th 4-7pm at Disney Springs WonderGround Gallery inside the Marketplace Co-Op! Details about the event are here and yes - we'll have my new Princess Aurora there! 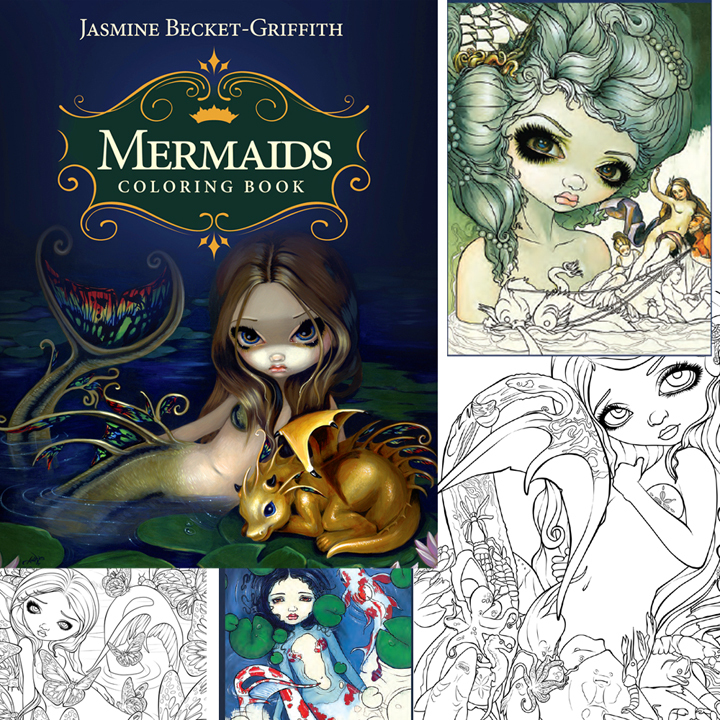 Next up - my new Mermaids Coloring Book has been popping up for preorder online! Amazon here , worldwide free shipping at Book Depository here , from the distributors Llewellyn here , AmazonUK here, and more (just use Google). Official release date is December 8 (but more probably will be out in November). We're having a release party at Pop Gallery on December 9th at Disney Springs ( details here ) and I'll be autographing them there. Next - I am GIVING AWAY a new original painting up at Patreon! A darling fairy girl with a fox-kitty! Subscriptions at Patreon start at just $1, anybody signed up by next Wednesday will be entered automatically, just click here for details. Next - I have three new original paintings to show you! 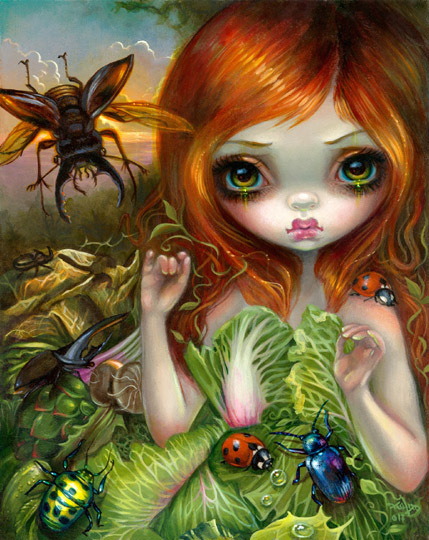 One original, "Insectarium I" is still available at the Eight and Sand Gallery- details and prints are here. 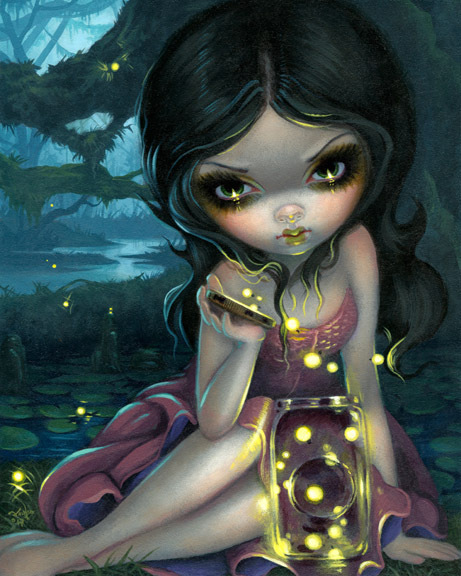 "Releasing Fireflies" original has sold, but prints and canvases are here. The third piece is called "Poissons Volants: Les Poissons Roses", hanging at the Corey Helford Gallery the original has also been sold, but you can snag prints & canvases here. Another new painting is my "Princess Aurora" for Disney that debuted at the D23 Expo! The original painting sold, but Disney has prints, canvases, shirts, magnets, postcards, mugs & more! Details about ordering from Disney are here or scroll down in this update - and yes, we'll have all those goodies at my Disney show next Saturday (details here). In other pin news - we have run out of Alice in Clockwork, so we have just now released the new Patreon Exclusive Pin - PAISLEY!! You can see her here! Only available through Patreon, she is the first free bonus pin you will receive if you join the Patreon Pin Collector tier, you will receive her along with the new August Pin of the Month - Mermaid with a Golden Dragon! Click here to sign up for the Patreon Pin Collector tier - it's only $25/month and includes shipping anywhere in the world, you'll get any Patreon Exclusive pins like Paisley and also the Pin of the Month each month, bonus items like lanyards, 10% discounts at Strangeling.com , previews & other goodies. I also give away my extra Exclusive pins there each month too along with original paintings & more. Click here to sign up. Beach Towels! Yep - I have beach towels! 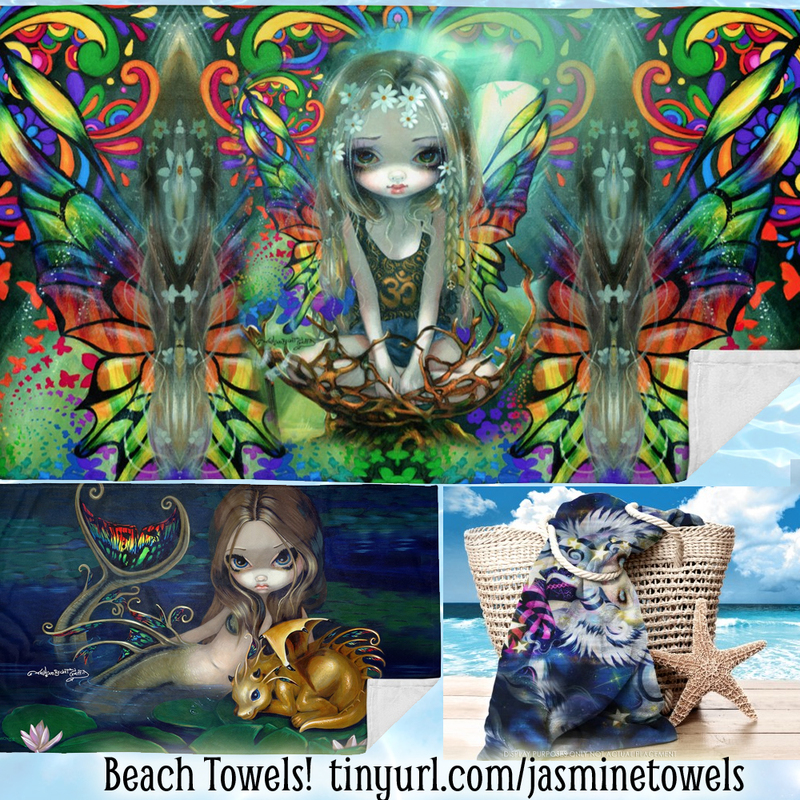 Available through People's Choice Apparel - many designs to choose from, and they ship worldwide - click here to see my new beach towels! Use the arrows to scroll through them all. The SALE print of the week is "Captain Molly Morgan!" Only $9.99 for prints, only $90 for open edition canvases. My wonderful pirate girl! Click here to see her! And finally - it's the last chance for my Abyssal Mermaid masterpiece edition canvases - the final #5/5 of the edition is up for auction here - a magnificent 30"x20" canvas hand accented in acrylic paints by me, signed and numbered #5 of 5. All the others are sold. Typically priced at $795 I have started the auction at just one penny to give everybody one final chance to snag one - click here for details. Yes, my new Mermaids Coloring Book has been popping up for preorder online! Amazon here, worldwide free shipping at Book Depository here , from the distributors Llewellyn here , AmazonUK here, and more (just use Google). Official release date is December 8 (but more probably will be out in November). The same size & format as my previous two coloring books (already available worldwide, just search Jasmine Becket-Griffith Coloring Book on google and you'll find tons) - 55 single sided images on creamy thick artist's paper. This one of course focuses on my MERMAIDS! We will also have them (eventually) available autographed through Strangeling.com - later this year though, as first I have to get them shipped from Australia to Florida so I can autograph them, and then I have to mail them to our shipping center in Kansas.... I will keep you posted! We have the first two coloring books already autographed now up at my website though here , available worldwide now. 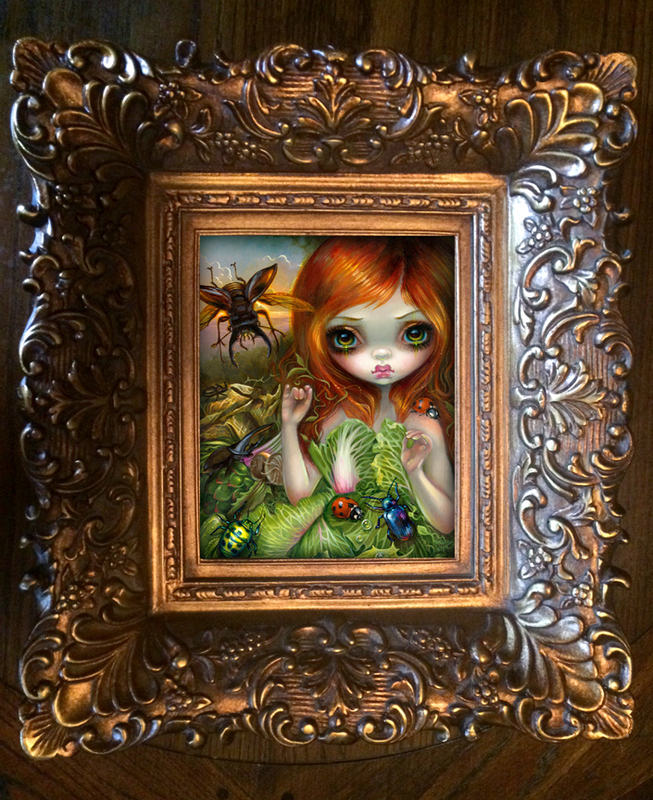 The original is available through the Eight and Sand Gallery as part of their Insectarium show! She is an original acrylic painting on an 8×10″ panel, beautifully framed (framed measurement is 16″x19″) and is priced at $2400. If you are interested in purchasing the original painting you can buy her direct from Eight and Sand Gallery HERE online or contact the Curator, Alex at eightandsand@gmail.com – the gallery offers short term payment installment plans and ships worldwide. Original painting has sold, but prints now available from $13.99 here - we ship WORLDWIDE. Another piece from the Insectarium show! The original painting sold, but we have prints - 8x10" glossy photo paper prints on sale for $13.99 - signed by me on the back, and we also have limited edition canvas prints (8"x10", wrapped on boards & ready to hang, hand embellished by me in acrylic paints, signed & numbered out of only 25 made) for $100. Please note - these are selling out FAST, so if you want a Limited Edition Canvas, snag one soon! We also have them available in our eBay stores! 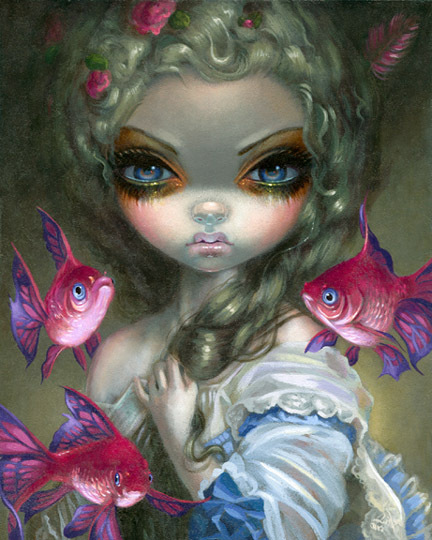 "Poissons Volants: Les Poissons Roses"
This beauty is from the Corey Helford Gallery's "Defying Gravity" show! The original painting sold, but we have prints - 8x10" glossy photo paper prints on sale for $13.99 - signed by me on the back, and we also have limited edition canvas prints (8"x10", wrapped on boards & ready to hang, hand embellished by me in acrylic paints, signed & numbered out of only 25 made) for $100. "Princess Aurora" is the painting that the Walt Disney Company contracted me to do as a special debut for the 2017 Disney D23 Expo! I was very happy to have the opportunity to paint her. She is of course Princess Aurora in her "Briar Rose" guise, from Disney's 1959 animated masterpiece "Sleeping Beauty." Don't live by Disney? Don't worry! Disneyland’s WonderGround Gallery is very happy to ship worldwide and takes orders via email at: merchandise.guest.services@disneyparks.com or by telephone at: 877-560-6477. 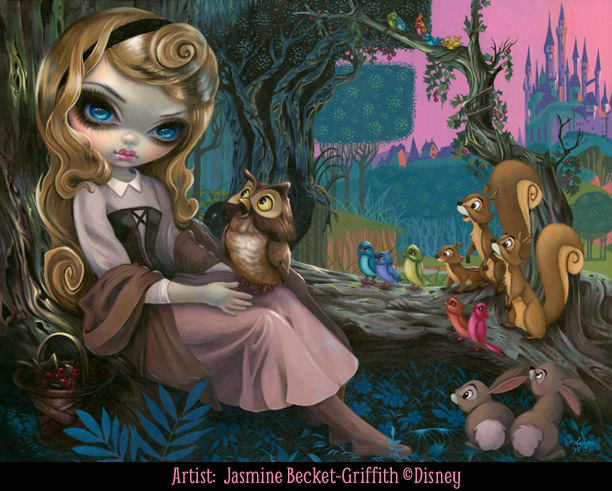 Just let them know you are interested in Jasmine Becket-Griffith’s "Princess Aurora" artwork from WonderGround Gallery and they would be happy to let you know what is currently available. You may also order this piece worldwide through Disney’s “Disney Parks Shopping App” available on your smartphone (if it's not there yet it will be soon). only at Patreon - click here to join! She's one of my Tiny Treasures - little 3x3" original acrylic paintings on wood! This little beauty has a magic white fox kitty friend - what a cutie. It reminds me a bit of my kitty Sunshine when she sits on the back of my chair while I paint (she hides under my hair!). We'll announce the winner at 8pm EST at Patreon! Again, all Patrons of all levels will be entered automatically - just be sure that your credit card info & contact info is up-to-date and valid (otherwise your name won't get indexed right into the system). If you are not yet a member, sign up by clicking here and click "Become A Patron" as long as you are signed up by 8pm next Wednesday you'll be entered! Subscriptions start at just $1, we have other fun stuff like early previews of paintings, Pin Collector Club, Patreon Exclusives & more. I do giveaways ALL the time, including original paintings like this one! As per your many requests, I have created an official Strangeling Pin Trading/Selling Group - this is a perfect place to meet up with other collectors, trade pins, try to score rare or exclusive pins, sell your extra pins, etc. I also post previews and news specifically about pins up there! It's a free facebook group here, just click join & you are in =) If you happen to have an extra Three Wishes Pin or an Alligator Girl Pin - hop up there - folks REALLY want to buy/trade for those! ;) Seriously, people are VERY much wanting them, you can earn some serious pocket money if you are willing to sell yours! 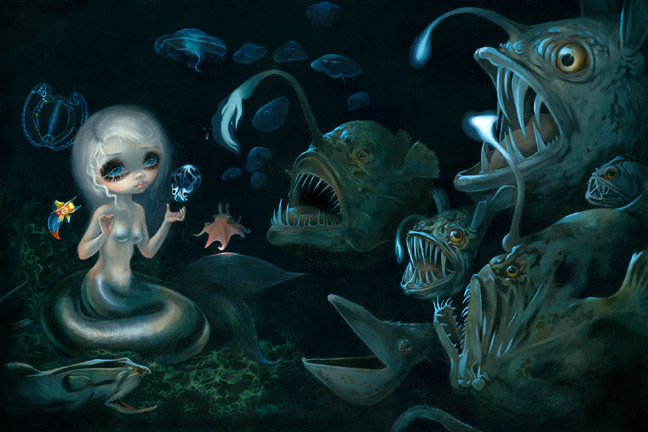 We have sold out of our Masterpiece Limited Edition Canvases for my "Abyssal Mermaid!" As always though, I've set aside the very last one to auction off to give everybody a chance. She is one of the super BIG 30"x20" masterpieces, hand embellished by me in acrylic paints, signed and numbered - #5 (only five were made). Regular price is $795 but for the last one I always start the bidding at a penny to give everybody one last chance to try to get one!